To start to answer those questions, I spoke with Daniel Warren and Dave Rapoza, the creative team behind the Steve Lichman Kickstarter Campaign – the project’s ending on Friday, October 30th at 9 PM PDT. As of this writing they’ve already past $140,000 in funding from their $18,000 goal and over 4,200 backers. 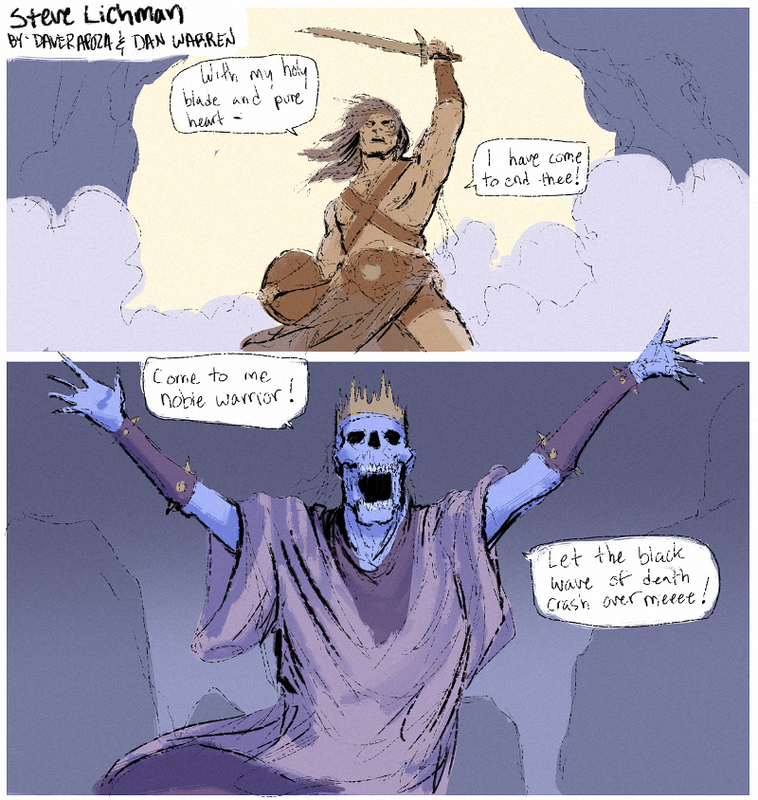 How did Steve Lichman – and the decision to bring him to Kickstarter – come about? Daniel Warren: Steve was basically just a joke that we started when we were both doing a lot of tabletop fantasy freelance. Dave Rapoza: Yea, we started the comic based around this job Dan was doing where he had to paint this Lich, and we just went off on a tangent about how Liches must lead the most boring horrible lives. They basically are waiting there to be killed. So, we started out doing a tumblr comic and it took off. Lots of people were sharing the first issue, but we basically did it for fun and without really thinking it’d be anything. After that we followed it up with a few more issues and decided to post it up to imgur. We ended up getting around 500k views on the first 9 issues and everyone said they wanted a full book. So, we dove into fleshing it all out and decided that Kickstarter would be great for a little preorder platform. Your initial goal was $18,000. What was your reasoning behind that #? Daniel Warren: Well, the whole point of the Kickstarter was to give fans of Steve who helped make the project what it is, something special directly from us. A lot of people reached out and commented about how they’d love to support it as a book, so we decided to go with that and do a limited edition hardcover for Kickstarter. In the beginning, we estimated we probably wouldn’t sell anymore than 700 books, so we came up with $18,000 dollars to fund it based on the numbers to make just under 1000 books happen. Dave Rapoza: Basically we were going to make no money, especially selling at $20 for a 230 page Hardcover. So we decided to make less money on the book and get the number down to 20 so that as many people who were fans of it could get it without paying a ton. Obviously there’s the fan response, but why do you think your project has been so successful? Daniel Warren: I think it comes down to 3 main things. The first is a hugely supportive network of fans, like you mentioned, that have been following, sharing, and helping us promote Steve for over a year now. Second is the fact that we decided to put out 60 pages of the book for free for anyone to read- including all the issues that were already on the internet plus a handful more. The reason we did this is sort of what leads into reason 3. Most Kickstarters follow the traditional Kickstarter model of creators having an idea, but no capital to make it, so then backers assume the financial risk and hope the creator delivers on their idea with their money. We wanted to flip that and assume all the risk ourselves – meaning that we would complete the book, on our own – at at our own expense – first, then launch a Kickstarter for the printing of a product that was already made. Jeremy Melloul: Right, Tyler and I talk a lot about the idea of putting some skin in the game with your Kickstarter and you guys definitely took that to the fullest. And it’s obviously worked for you. Daniel Warren: I think a big part of the response is people realizing the book is done and the project isn’t a gamble like some others are. It’s something they can go read already and that will go directly to the printer the day it is funded. We’re both big Kickstarter fans and have supported lots of projects, but some take 3 or 4 years to ship and we just didn’t think that was fair to Steve fans. Dave Rapoza: Yea, even having everything done, people still assume because of the bad reputation of Kickstarter projects falling apart, that ours would be a gamble. Which is too bad, we hope that this success and quick turn around of the book will give us more credibility when we move into the following books. Daniel Warren: We want to assume as much responsibility as possible, and just use the platform as a pre-order service to gauge demand. Regarding demand, there’s obviously a ton of that and you’ve talked about how the fan response was integral to even deciding to do the project. But there’s an element of that that comes from you too – I’ve noticed that you’ve been really active in the comments of your Kickstarter page, why do you think that’s important? Daniel Warren: I try to answer all questions the second I see them on the comments and messages. I think it’s important because they’re from people who are willing to give us money to make a thing we enjoy- and that’s really awesome. If they’re willing to give us the amount of money they have to pursue something we love, the least we can do is be there for them when they have any questions or concerns. From the get go we wanted to be as transparent and open about the entire thing as possible, so we try to immediately help with anything we can when a question or problem pops up. Dave Rapoza: We spend a fair amount of time responding to every imgur comment, reddit, Twitter, and emails. We just wanted to show that we really do appreciate all the feedback and comments. For something like this, it’s the most personal project we’ve ever done, so it means everything. Daniel Warren: Just from personal experience backing other projects, it always stands out when people treat their thing like a community and let themselves be available to the fans backing it for conversation and communication. It’s the reason I’ll get behind Yacht Club Games forever. 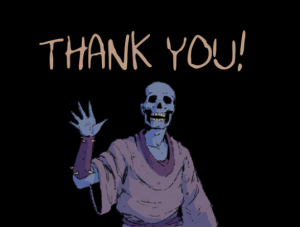 They ran their Shovel Knight Campaign (https://www.kickstarter.com/projects/yachtclubgames/shovel-knight) that way and it made a huge difference to me. We can’t thank everyone who’s backed our Kickstarter enough honestly. It’s still absolutely crazy to us that this is happening. we owe everything to the fans who did that for us, so of course we’re there for them. Normally, once you blow past your goal, you’re expected to set stretch goals – but you haven’t yet and you mentioned to me before the interview that you weren’t planning to – can you explain that decision? Daniel Warren: Basically there are two reasons. 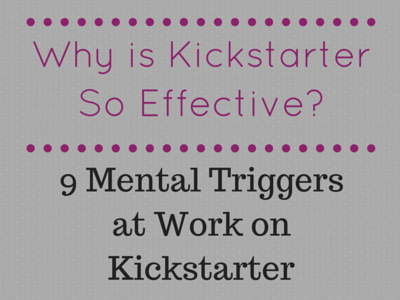 The first is that the majority of Kickstarter campaigns that fail or under-deliver do so due to over-promising. It’s such a problem that Kickstarter even sends emails to funded projects telling them to be very careful of doing stretch goals, and to avoid them. The second reason is that we cut the costs of the project so far down already to get the hardcover book to 20 bucks that we aren’t making a ton of profit. What we do make will go directly into finishing the next Steve book, and the one after that. Dave Rapoza: Yea, we didn’t want to over complicate our Kickstarter in any way. It seems that with a lot of Kickstarters they tend to over-promise and end up setting the project back as a whole. We didn’t want to get to a point where we were setting our timeline back so we could send out t-shirts or other rewards. We streamlined our entire approach so that we could make sure that everyone would have their book next year. Also, keeping the book at $20 meant that we weren’t going to be able to offer a lot outside our initial asking goal. 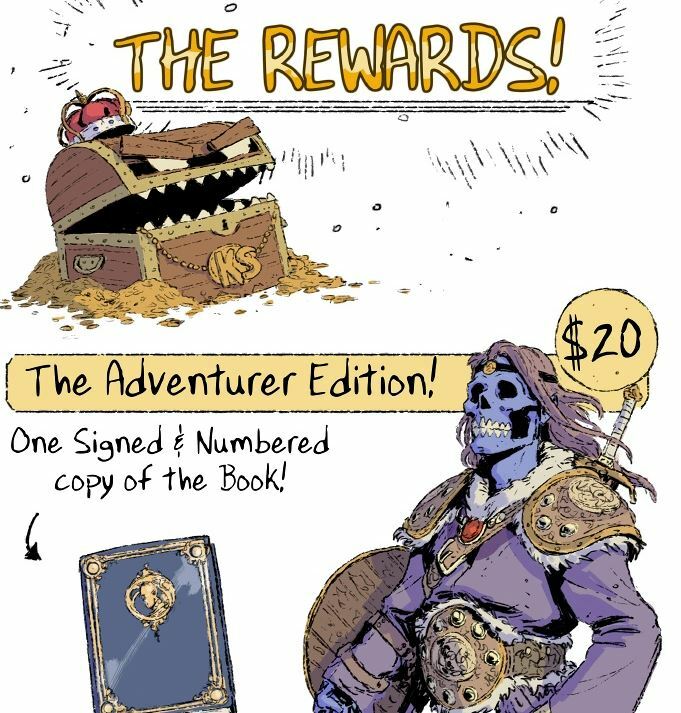 We would have had to bump the price up per book to make the stretch goals possible. Daniel Warren: Our goal is to get a quality thing people want to them cheaply and quickly. Stretch goals seriously inhibit both of those aims. I also think, on a related note, that stretch goals come from that mentality we mentioned earlier, where a project is in development when people back it, and isn’t done, so adding in some extra in the process can work. But with us, the book’s done already. Meaning stretch goals would have to be physical things that we’d have to ship out so it would cost a lot. That’s a very prudent decision. I know you said you’ve backed a lot of Kickstarter projects, is this your first Kickstarter project? Daniel Warren: Yes, for both of us. But a big part of the decision was that I’ve worked on about seven, for other people – miniatures companies, woodworkers, card stuff. Daniel Warren: Yea exactly, I learned a lot about the risks of running this kind of thing from them. So with this first Kickstarter now definitely successful – it’s not quite over yet obviously and there’s still fulfillment ahead – but is there anything you’d do differently the next time you run a Kickstarter project? Daniel Warren: Honestly for the next one most of what we did this time will be the same. 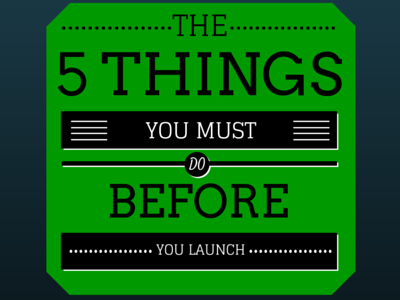 We want to keep it streamlined and focused so it can be cheap and efficient for backers. The big things that would change would only be tier rewards, cool one off things. This time we did a lunchbox with some special surprises inside, next time we could do a bunch of other stuff. We never want to repeat anything so that each Kickstarter feels unique and one of a kind. Yeah, it’s obvious you guys both really care about making this special for your backers and want to make sure it’s a positive experience for them – which I think would be a great lesson for other creators looking to run their own campaigns to learn from you. 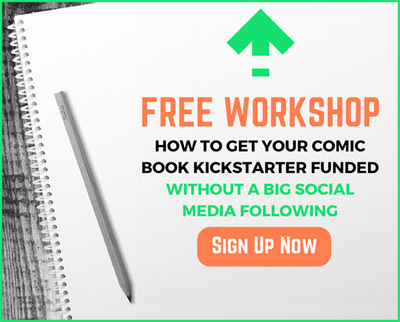 With that in mind, do you have any advice for creators looking to achieve the same six-figure level of success you guys have on Kickstarter? Daniel Warren: The best advice we could give anyone is to finish a lot of your project on your own, and to be completely transparent about it. Showing people a lot of what you intend to do and having it done for them as a proof of concept helps with the confidence in a project. Dave Rapoza: Share what you’re doing with them to some extent, let people understand the comic and see if it’s for them. Daniel Warren: And treating the backers like people who are helping you, and not as customers is also huge. Be respectful and answer any questions anyone has – it should always be a level discussion. I can’t stress enough how dead that model of ‘give me money now and I’ll show you later’ is. You need to prove to people it’s worth helping out. Dave Rapoza: Also, as far as the six figure thing, I don’t think you can ever know you’ll get that response for sure. Especially if you’re just starting out with your first ever book. For us, if it weren’t for all of the people reposting Steve on reddit and imgur, we wouldn’t be in this position right now. It helps a ton to be involved in whatever community supports you already. Daniel Warren: It’s all relative. Some projects need more and some need less, so the end number is always relative to what the creator needs. Dave Rapoza: We honestly didn’t receive very much coverage for Steve Lichman. What little we did was from people we already knew a little bit from our previous work as illustrators. From our own experience, it’s very hard to get comic reviewers to read a book that has the Kickstarter label on it. But thankfully, people already loved Steve enough to get us to the point we’re at now. So, we can’t thank everyone enough for giving us the opportunity to do the thing we really love doing. It’s amazing. Jeremy Melloul: Absolutely, I think what you guys have done is awesome. And I’m looking forward to seeing you do more. The Steve Lichman Kickstarter ends on October 30th. If this interview was useful to you, show Daniel & Dave your gratitude by backing their Kickstarter!